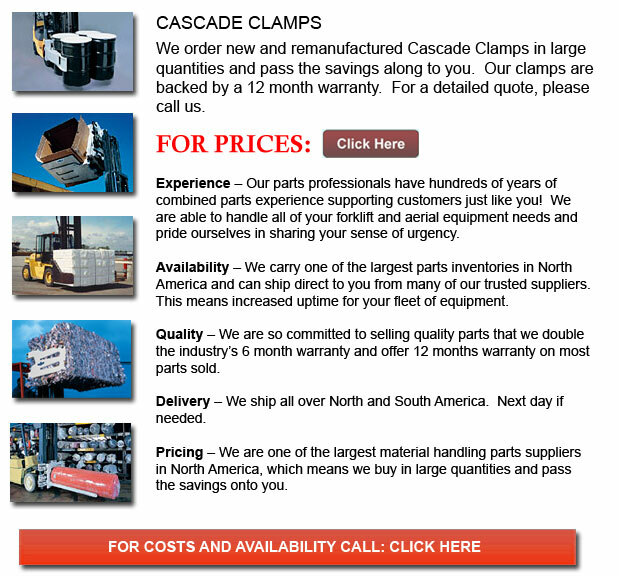 Cascade Clamps - Established in Portland, Oregon in the year 1943, the Cascade Manufacturing Company started as a small machine store employing only 4 people. Total sales for that initial year amounted to about $60,000. The first recorded sales revenues involved the machining and assembly of stainless steel valves, pipe fittings and different parts. During 5 years of operation, the company had expanded to 40 staff and their annual sales volume had risen to three hundred thirty thousand dollars. Nowadays, Cascade is amongst the leading worldwide manufacturers in the material handling trade. Manufacture and design of the company's original hydraulic cylinder paved the way in Cascade's aggressive pursuit of better business possibilities. During the past sixty years, the material handling business has matured into a very sophisticated field and Cascade has proudly played a part on this improvement. Cascade currently continues to grow as the leader supplier of forklift attachments and different related products. The business feels certain in their capability to continue to lead the way within the business by understanding client's needs in the future and remaining competitive within the global market. In the nineteen fifties, Cascade began designing, fabricating and promoting hydraulic accessories. Manufacturing was completed in 1956 on a brand new office so as to house all the office and plant operations in Portland, Oregon at the company's present headquarters. Following 15 years of business, total workers reached 180 staff and sales had reached nearly two million three hundred thousand dollars. A second manufacturing plant was built in the year 1959 in Springfield, Ohio. nineteen sixty marked Cascade's initial move into the global world of the material handling industry as the business established interest in England, Australia, and the Netherlands. The business altered its name to Cascade Corporation in the year 1964. In the year 1965, Cascade went public with a preliminary offering of two hundred thousand shares of common stock. The company has expanded its production plants within the U.S. with places in Portland, Oregon, Springfield, Ohio, and Warner Robins, Georgia. Cascade products are fabricated worldwide due to numerous subsidiary operations. In the year 1944, a brand new facility was completed in Almere, the Netherlands which is Cascade's European head office. This plant is designed to be the essential customer support centre. Cascade further expanded their product base in 1996 and 1997 after buying five companies, which included the Kenhar Corporation, the international leader in blades.